Susi reportedly fell asleep in a VIP lounge of the airport after attending a United Nations conference about maritime affairs in New York on Sunday, during which she got a compliment from actor Leonardo DiCaprio for combating illegal fishing and for protecting the sea. The picture was uploaded onto a Facebook account owned by a Jim B. Aditya at 12 a.m. on Monday. “This super woman deserves to be called the mother of Indonesia’s seas,” Jim wrote as a caption. Jim added that DiCaprio also called her a brave woman who inspired the world. Hollywood actor Leonardo DiCaprio and the Maritime Affairs and Fisheries Minister Susi Pudjiastuti have two things in common: They are famous for their strong roles in the shipping scene and are deeply in love with the marine world. Edi was among 473 people who wrote comments about the photograph. 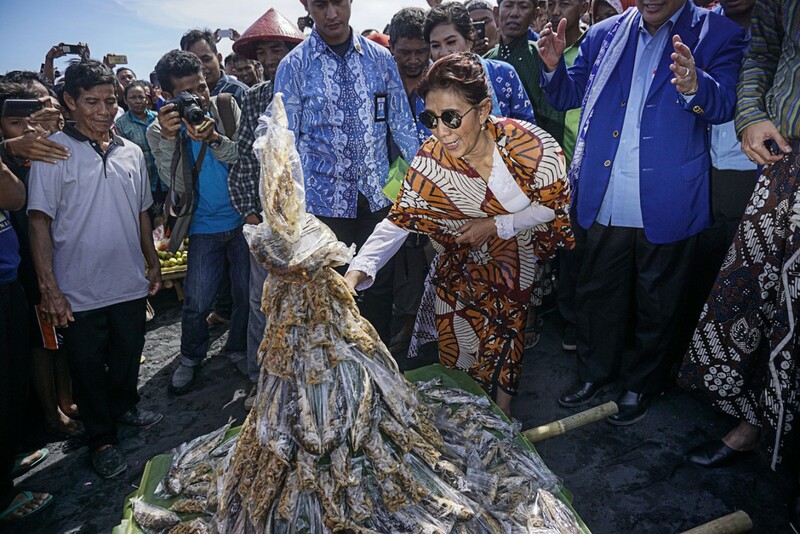 Sea harvest: Maritime Affairs and Fisheries Minister Susi Pudjiastuti attends the celebration of the 44th anniversary of the Indonesian Fishermen’s Association (HNSI) on Depok beach in Bantul, Yogyakarta, on May 21. The picture of the Indonesia’s Minister Susi Pudjiastuti had been shared by at least 1,700 users and attracted 10,000 responses by 12:40 p.m. Back home in Indonesia, her subordinates also done an excellent job in protecting the rich potential of Riau-islands, Indonesian’s provincial isles near Batam city island. A Vietnamese Coast Guard vessel dropped anchor in Batam, Riau Islands, on Friday, to pick up 695 Vietnamese fishermen arrested and found guilty several years ago by Indonesian authorities for fishing illegally in the country’s waters. The biggest ever repatriation of foreign fishermen was conducted based on an agreement between Indonesia and Vietnam. The Indonesian government denied that the repatriation was part of a barter agreement for the return of crew members of a Fisheries and Maritime Resources Surveillance Agency (PSDKP) vessel, who had been taken hostage following a clash between the patrol vessel and a Vietnamese Coast Guard boat on May 21. Previous articleEd Sheeran concert ticket in Indonesia are now on sale!